A subtle (and pretty) symbol of the empowering community you're a part of. 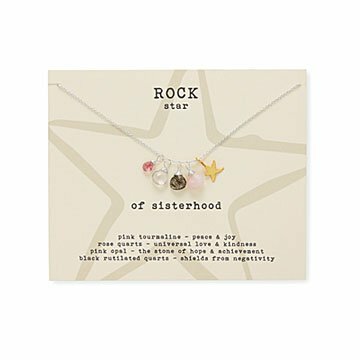 Inspired by strong women around the world, this necklace celebrates "sisterhood" and your place in it. The design is a stunning yet subtle symbol of that empowering community you're a part of, featuring a row of gemstones: pink tourmaline (peace & joy), rose quartz (love & kindness), and pink opal (hope & achievement). The last one is black rutilated quartz (positivity), giving the piece a rock star edge and a wonderful gift for the woman in your life who definitely has one. Charms are cast in Thailand, then sculpted and created in Italy. Stones are hand-cut in India. Hand-assembled by Mary Steratore in Pittsburgh, Pennsylvania. It can be daunting trading one career for another, especially when there are PhDs involved. But for Mary Steratore, it led to true artistic expression. Leaving archaeology to create her own fine art, Mary settled in Rome, where her paintings and sculptures were well-received. After showing her work throughout Italy and the US, she developed a new line of jewelry inspired by her sculpture. Clean using silver polish with a soft cloth. The gem stones are high quality and the colors play off each other in a pretty way. The star gives this beautiful necklace a little bit of fun and pizazz. And even though one could be cynical about the packaged female empowerment / bonding message, somehow it's still a lovely sentiment. My friend was thrilled. A perfect gift for my daughter's friend. Stylish and with an uplifting message! I love the design and the combination of charms on this necklace, however I wish the chain was heavier and more durable. I do not think this chain will stand up to everyday wear. The idea and sentiment is brilliant though. A necklace to wear for any occasion. Perfect gift for my sister! The necklace was very sweet. This necklace is so beautiful! My sister loved it and said she feels great every time she wears it!